The Aromamizer RDA Atomizer is considered the most flavorful rebuildable atomizer in the market. There are two shapes available: circular and hexagon. 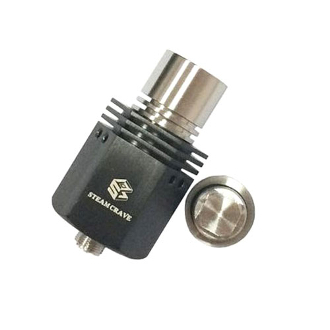 This atomizer features a Cyclone airflow system. It has special air channels to prevent the cap from overheating and keeps the temperature balanced to minimize any flavor loss. To prevent any spit back, the Aromamizer has a special designed drip tip and the 510 adapter has 100% spit-back protection that allows the vapor to pass through the 4 sides at the bottom of the drip tip. There are 6 air holes total that are measured at 2.2mm. The juice well is deep enough that it is measured at 2.5mm. The hexagon shaped design looks great on any box mods in the market today. The package also comes with 510 threaded drip tip adapter, which allows you to use any of your favorite drip tips on this RDA. Design and features on the Aromamizer RDA will enhance your vaping experience in many ways. This product is for advanced users only. It has a risk of damaging your mods, devices, and batteries if it is being used improperly. Please make sure that you have great understanding and have done researches on this product before purchasing. We strongly recommended that you always test the coils with an ohm-meter before using them with your mods, devices and batteries. Coils with low resistance are not suitable with all mods, devices and batteries. Please make sure that your mods, devices and batteries can handle low resistance before using them.